The banner depicts an open highway between Gibraltar and Jerusalem, crossing the five North African nations - Morocco, Algeria, Tunisia, Libya, Egypt, and ending in Jerusalem, Israel. It represents a seven-year Prayer Journey led by Ben which also included the three Southern spiritual gateways of the Mediterranean, namely Gibraltar (West), Malta (Central), and Istanbul or old Constantinople (East). The design conveys the Mediterranean as the centrepiece, signifying that it's like the womb of the world, with end-time scenarios, religious and nationalistic struggles being birthed from this region. The wall of the city of Jerusalem with the Golden Gate depicts both a present reality linking the highway to this city, as well as the prophetic fulfilment of the New Jerusalem coming down out of Heaven as part of Christ's coming kingdom. The Lion signifies three different aspects - the rule and reign of the coming kingdom of the Lion of Judah, the Messiah; that He, the Lion of Judah, is sovereign and in complete control as portrayed through his serene facial demeanour, and thirdly, His fiery mane signifies the burning up of the old order, ushering in the new and coming kingdom with power. The stars of the Southern Cross, at the bottom of the banner, are testimony to the fact that God called teams of Australian and South Pacific pray-ers to come from the present uttermost region of the earth to go to the ancient uttermost part of the earth, Gibraltar, in order to open the ancient doors and to help rebuild this highway of righteousness on behalf of those who call these nations home, from the Maghreb in the West to the Mount in Jerusalem in the East. 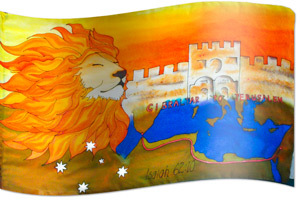 "The Lion of Judah over Jerusalem"
Ancient Doors, Highway of Righteousness, Jerusalem, Gibraltar, Mediterranean, Lion of Judah, Golden Gate, Australian, South Pacific, Southern Cross. Red: Atonement (Isaiah 1:18, Joshua 2:18, 21, Leviticus14:52; Hebrews 9:14; 1 John1:7), Bloodshed, Blood of Jesus, Cleansing, Death, (2 Kings 3:22, Revelation 6:4, 12:3) Life Sacrifice, War.